Ages 11 -16. Roald Amundsen, Douglas Mawson, Robert Scott and Ernest Shackleton. A presentation summarizing their achievements and legacies in the Heroic Age of Antarctic exploration for use in schools by teachers and students or anyone interested in their stories. With associated worksheet and lesson plan. The Heroic Age of Antarctic Exploration lasted from 1897 to 1922. At the start of the era Antarctica was largely unknown, whalers and sealers frequented the more northerly of the Antarctic islands, but the continent in particular was a terra incognita (an unknown land). In a short time period many expeditions went to Antarctica to explore geographically and carry out scientific experiments and measurements. Great hardships were endured and many valuable lessons were learned in the hardest possible ways. Copyright: Material on these pages is copyright Paul Ward / CoolAntarctica.com. It may be used as a presentation or printed for personal or public performance as long as it is not for direct or indirect commercial use (no pay to view, no use behind a paywall). It may be altered or modified, but not made publically available or transmitted to others in original or modified form without the written permission of Paul Ward / CoolAntarctica.com. Don't even think about trying to sell this free resource. All of the pictures in this resource are in the public domain. Norwegian Roald Amundsen led the first successful expedition to reach the South Pole, he arrived there on the 14th of December 1911. A team of 5 men arrived there by dog sled 57 days after leaving their winter base camp and their ship the Fram. They had all gained weight on the journey to the pole. After a short break, the journey back to their ship took them 39 days. They had set out with 52 dogs and returned with 11, the rest had been killed to feed the others and the men along the way. The returning dogs and men were all in good health. 3- Amundsen was 39 years old at the time, he was an expert in polar travel having spent his whole adult life involved in extreme travel and exploration in the Arctic. Wild places and exploration were what he lived for. Amundsen had lived alongside Inuit peoples in the north, he learned their survival techniques. He learned how to travel with dog sleds and how to dress for extreme cold using furs whether you were at rest or involved in strenuous activity. The men he took with him were also experienced in polar conditions. His South Pole journey was very focused, there were virtually no scientific measurements taken and no scientists. The trip was meticulously planned and executed, every detail of food stores and all equipment was tested and evaluated in advance and modified if necessary, nothing was left to chance if it could possibly be addressed. He proved beyond any doubt that planning and skill in using dogs and skis were of extreme importance in a polar environment where "difficulties" could mean the difference between success or death. 4 - Much is made of the "Race to the Pole" with Robert Scott. It was only really Amundsen who decided there was a race. He had intended to be the first to the north pole, but shortly before he was ready, the news broke that Cook and Peary had already reached it. Having invested more time and money than he could afford to lose, with debts to pay and with backers depending on him, he decided to try for the South Pole even though he knew Scott had already set off thinking his was the only attempt at that time. He didn't even tell his own crew when they set off from Norway aboard the ship Fram, just the captain and two others. The rest were told after the ship had sailed thousands of miles south to Madeira. Amundsen was considered to have acted in an ungentlemanly manner which in 1911 was about as serious an accusation as could be made. 5 - After returning from Antarctica, Amundsen paid off his debts and used the money he made to establish a successful shipping business. He used the money from this to finance exploration of the Arctic by air. He never returned to Antarctica. He died 17 years after reaching the pole in June 1928 with a crew of five in a small flying boat that took off from Tromso, Norway on a rescue mission for the Italian balloonist Nobile and two others whose airship had crashed on the way back from the North Pole. Amundsen took the criticism of the manner in which he became first to the South Pole badly. It is said that he was much troubled by the fact that Scott and his men died, though his actions had no actual impact or influence on Scott's men. He was described as unhappy and that he felt the rest of his life to be an anti-climax. 6 - He didn't receive the same adulation or financial security as his mentor Nansen, even though Amundsen's achievements eclipsed Nansen's. He had become the first person to visit both poles when he drifted over the pole in an airship from Spitsbergen in Norway to Alaska in 1926 and had led the first successful navigation of the fabled North-West Passage in 1903-1906 in the Gjoa. The "Fram Museum" was opened in Oslo, Norway in 1936 to house the Fram and tell the story of her voyages, of which Amundsen's South Polar trip was just one, in 2013, the Fram was joined by the Gjoa. Amundsen was overlooked for many years, largely being in the shadow of Scott, it was only when the Scott myth began to be questioned from the late 1960's onwards that Amundsen was able to emerge from the shadows somewhat, even in his native Norway. Not until the 100th anniversary of reaching the pole, on the 14th of December 2011 was a South Pole monument to Amundsen and his party unveiled in Oslo, the Norwegian capital. There is now a research station at the South Pole called the Amundsen-Scott station and many features in Antarctica named for Amundsen. Douglas Mawson was born in Yorkshire, moving to Australia at the age of 2. He is not as well known as some other Antarctic explorers but is one of Australia's best known and most respected heroes in any field. He first went to Antarctica with Ernest Shackleton on the 1907-1909 Nimrod expedition when he was one of a party of 3 to reach the Southern Geomagnetic Pole for the first time, manhauling a sledge for 122 days to do so. He was invited by Robert Scott in 1910 to join the prestigious Terra Nova expedition but declined and chose instead to lead his own Australian Antarctic Expedition to the region of Antarctica immediately south of Australia, almost totally unexplored at the time. He was driven by a quest for knowledge rather than by financial gain or the seeking of personal glory from geographical firsts such as reaching the South Pole. Instead, there was an extensive scientific programme and many specialist scientific staff on the expedition crew. 8 - Mawson's Australasian Antarctic Expedition (AAE) of 1911 - 1914 is most famous for a sledging trip undertaken by Mawson and two others, Xavier Mertz and Belgrave Ninnis. In November 1912 they set off on a trip to survey a new unexplored area, collect rock specimens and record scientific data along the way. A month into the journey Ninnis fell through through a crevasse with six of the best dogs, a tent and many supplies, they never saw him again. They turned back to the base, now in great difficulty due to the losses of food, shelter and other supplies. Just under another month later Mertz died from starvation, physical exhaustion and possibly from vitamin A poisoning from eating dogs' livers. Mawson was left alone, it took him 30 days to struggle back to the base, at one point falling into a crevasse saved only by his manhaul harness attached the sledge which remained at the surface. 9 - In spite of these tragedies, the Australasian Antarctic Expedition is today regarded as one of the greatest polar scientific expeditions ever because of the detailed observations in magnetism, geology, biology and meteorology that were made, the expedition created 22 volumes of AAE Scientific Reports. Mawson returned to his lecturing post at an Australian university. He was knighted in 1914 and received a great many international honours during his life. He was made a fellow of the Royal Society in 1923, was a foundation fellow of the Australian Academy of Science, and president of the Australian and New Zealand Association for the Advancement of Science from 1935 - 1937. The Australian Academy of Science hosts a Mawson Lecture and awards a Mawson Medal award each year. Mawson led two more voyages to Antarctica in 1929-30 and 1930-31 on board Captain Scott's old ship, the Discovery. He died in 1958 at the age of 76. There are many geographical features in Antarctica and Australia named after Mawson, his picture has appeared on $1 coins and the $100 note. On the 17th of January 1912, Briton Robert Scott arrived at the South Pole with a party of four others to find a tent with messages for him from Roald Amundsen who had arrived about 5 weeks earlier. Scott's team had arrived at the pole 77 days after leaving their winter base by manhauling, walking and pulling their sledges behind them. Though they had taken motor sledges, dogs, ponies and skis to Antarctica, they didn't use them effectively. Manhauling was also seen as a more "pure" approach to the task. They were in poor condition when they arrived at the pole living on a starvation diet that was insufficient for their needs. A combination of weather, starvation, scurvy and accidents led to the deaths of all 5 men on the return journey, just 11 miles from a food and fuel depot that could have saved them. 11 - Scott's party had woollen underwear and insulating layers with a windproof outer layer, this system is used today with more modern materials, though Scott's clothing lacked ventilation and soaked up sweat during the heavy exertions of manhauling which then froze. Scott was a Naval man, he had turned to polar exploration as a means of seeking advancement partly due to reduced family circumstances, he wrote: "I may as well confess that I had no predilection for polar exploration". His first Antarctic expedition had been in 1901-1904 on board the Discovery where he first attempted to reach the pole coming to within 530 miles. 12 - The bodies of Scott's party were not found for 8 months after they died in their tent. Word reached New Zealand on the 10th of February 1913. 4 days later on the 14th of February a memorial service was held at St. Pauls' Cathedral London, attended by the king. The men were regarded as the most worthy of heroes. A public appeal for money paid off all the expedition debts. Payments were made to the widows and children of the dead men. What was left paid for the establishment of the Scott Polar Research Institute at Cambridge University. A museum attached to the institute houses many objects from the expedition and continues to be a world centre of excellence today. Dozens of public statues and monuments were erected to Scott and his party over the next few years in Britain and other parts of the world. His reputation was further enhanced by books and films up to the middle of the 20th century. Scott wasn't so much recognised as glorified. 13 - His widow was made Lady Scott in recognition of the knighthood her husband would have received. Today Scott is seen more in context with his time. Amateurish at times and held back by protocol at others, though ultimately virtuous of intent, gentlemanly in conduct and able to see the bigger picture beyond the headline attainment of the South Pole. Scott recognised the importance of scientists in Antarctica and was a leading light in scientific as well as geographic exploration. In addition to many places named after him in Antarctica, the research station at the South Pole is called the Amundsen-Scott Station. In 1902, Ernest Shackleton was one of a party of 3 along with Captain Scott who reached a then Farthest South coming within 530 miles of the South Pole. 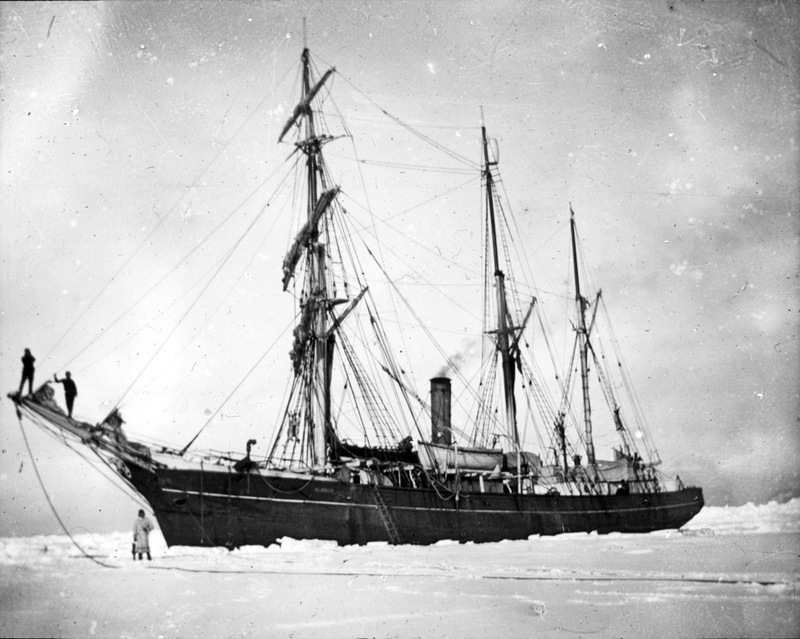 In 1908 on his own expedition on the ship Nimrod, he came to within 97 miles of the pole as part of a party of 4, another Farthest South. In 1914 he set out again, the pole having been reached, his intention was to cross the Antarctic continent from one side to the other via the South Pole. The ship, the Endurance, never even reached land in Antarctica, she was stuck in ice and then crushed, Shackleton and his crew had a 19 month ordeal before they returned to safety. Applied for a commission to the Royal Navy - rejected. Became a journalist - left quickly. Become the Secretary of the Royal Scottish Geographical Society - briefly. Stood for parliament - unsuccessfully. Started a troop transport scheme - came to nothing. Tried to promote a tobacco company - came to nothing. Began a scheme selling stamps - came to nothing. Tried to develop a Hungarian mine - came to nothing. He did however receive many public honours including a knighthood. He was part of the first party to climb Mount Erebus. He was given an OBE in recognition of his efforts in the First World War. His most successful means of earning money was lecturing about his Antarctic trips. He was almost constantly in debt, particularly due to his expeditions. He was fortunate enough to have many of these debts written off following his inability to repay them. 16 - Shackleton died of a heart attack at the age of 47 in 1922 at the edge of Antarctica on South Georgia, at the very beginning of what would have been his 4th expedition. His death is considered to have brought about the end of the "Heroic Age" of Antarctic exploration. Despite his rather chequered career and the fact that he never achieved most of his goals Shackleton is considered to be one of the most successful leaders of all time and one of the greats of Polar Exploration. He was admired and most of all trusted by the men under his command having the "common touch" , able to converse and have a joke with anyone. He led by example, he was ever eager and enthusiastic, sharing excitements and successes but keeping worries largely to himself. 17 - Shackleton's style is a by-word for calm, reflective, effective leadership under pressure when faced with uncertainty and changing circumstances. The story of the Endurance expedition is of overcoming a series of obstacles any one of which is seemingly insurmountable. The crew were unanimous in their view that it was Shackleton who held things together and was instrumental in bringing them all back alive. This despite being faced with a widely varied team in temperament, ability and attitude to the situation they found themselves in. In the 21st century Shackleton has become a hero for a different group, businesses leaders where he is used as a shining example of leadership in difficult circumstances.